That's right, it's the sleek, new-looking logo of Ragnarok Online 2 recently unveiled by Asiasoft in celebration of their first anniversary. Marking calendars on the 7th of January and turning a year older, its official publisher Asiasoft has promised us new contents and more importantly even more activities all year round. RO2 players might now be familiar with Advent of Valkyrie, one of RO2's largest content update yet, which will also mark a new milestone in game with the much-awaited launch of the 'Job Master' level, enabling its dedicated fans who are already on level 50 to break limits and reach out further. Asiasoft has also promised that as levels improve, skills to master the game greatly extends with even more challenging tasks, battle strategies, and also the opportunity to unlock weapons to pair their rank. We mentioned that Asiasoft has some activities lined up for its fans, you'd be happy to know that to truly embrace the spirit of giving during birthdays, there will be a raffle draw with an Aftershock Gaming Laptop, a Razer Black Widow Mechanical Keyboard and obviously more up for grabs. And there is simply no easier way to drop an entry than logging in anytime between the 7th of January to the 6th of February. 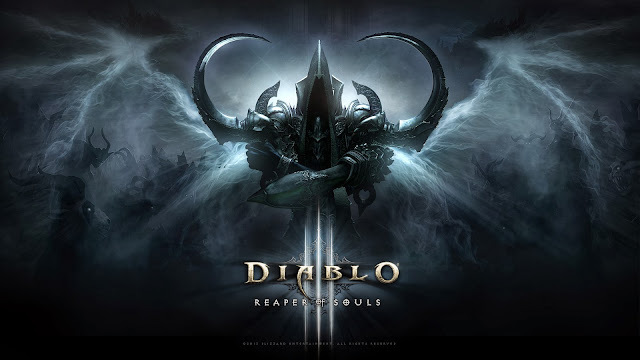 Highly-acclaimed franchise Diablo 3 has been long standing strong, and its similarly-renown creators Blizzard has recently announced a third installment, Reaper of Souls, set to unleash globally on the 25th of March, 2014. Closer to home, Asiasoft has also informed us that they will once again take the role as SEA's official distribution partner. Folks from the Phillipines, Thailand, Singapore, and Malaysia of course, will be able to get your copies first hand, straight from the set. Diablo 3: Reaper of Souls will welcome a new champion, the Crusader, among the original five heroes. But that's not all. “With Reaper of Souls, we’re taking Diablo III back to its darker, deadlier roots and also giving players a new way to experience the game” - Mike Morhaime, CEO and cofounder of Blizzard Entertainment. Besides a new character class and a new chapter in its epic journey, Mohaime pointed out that they will also be opening up the world and introducing a more flexible storyline for players to explore the game however they think its best. Picking up from the trend of being open-world and what not, Diablo 3: Reaper of Souls will come at a RM125 suggested retail price for the standard edition, and RM250 for the exclusive Collector's Edition, which will include certain collectibles such as a Reaper of Souls mouse pad, and in-game exclusives like a Spectral Hound minion who players can take on as their journey companion, as well as 3 additional character slots to accommodate new heroes. Of course, as always, these are just some of the features we personally think might be useful. For the full set of what you can get, do check up sea.blizzard.com and don't forget to keep a lookout from Aisasoft as the new year beckons to come. This is the tagline of League of Legends' latest champion, Yasuo. 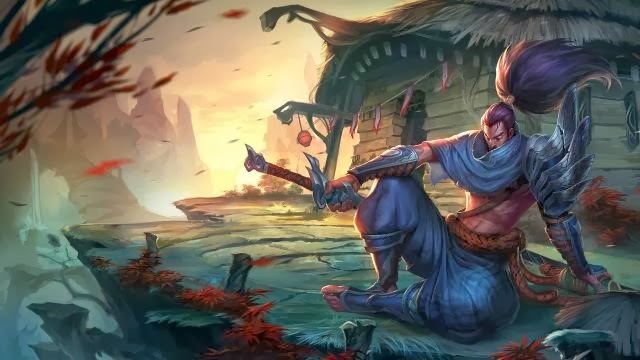 Known also as a top-lane player, Yasuo is a champion that does not depend on mana but instead fights courageously with his attacks and combos he is made famous for. First off, Steel Tempest is Yasuo’s first skill. There is 2 ways to Steel Tempest. The first click on Steel Tempest, Yasuo damages a enemies in a line. When Steel Tempest is cast 3 times, Yasuo lets out a twister that knocks enemies airborne in a line. Yasuo’s second skill is Wind Wall. Wind Wall generates a powerful shield that blocks off every enemy projectiles except turret attacks. His 3rd skill, Sweeping Blade. With Sweeping Blade, Yasuo jumps to and damages the targeted enemy. With a combo of Sweeping Blade and Steel Tempest, Yasuo jumps to the targeted enemy and spins while damaging surrounding enemies. If Sweeping Blade is combo-ed with Steel Tempest’s 3rd cast, Yasuo not only hits his surrounding enemies but also knocks the surrounding enemies airborne. Lastly, Yasuo’s ultimate, Last Breath. Last Breath does a huge amount of damage to the enemies with condition, the enemy must be airborne. Last Breath can also be activated on multiple enemies if the targeted enemies are all airborne. It’s one of the more damaging skills that can pick up multiple kills if used correctly. Combos are always impressive to be seen, but simply not easy to execute. But meanwhile, we'll get back to practicing (more like playing, tsk) around with the new guy in town. Since its release in October, we have finally gotten our hands on a copy of Nintendo’s latest, Pokemon X and Y 3DS. Both copies of the game are both similar in every aspect but the only difference are the Pokemon you can get in their individual versions. Let’s start off with what’s different from their older generations of Pokemon. Pokemon X & Y offers an amazing graphic improvement compared to the previous Black 2 and White2. Like most 3DS games, Pokemon X and Y are set in a 3D dimensional world to walk around and the camera tilts as you enter different areas. 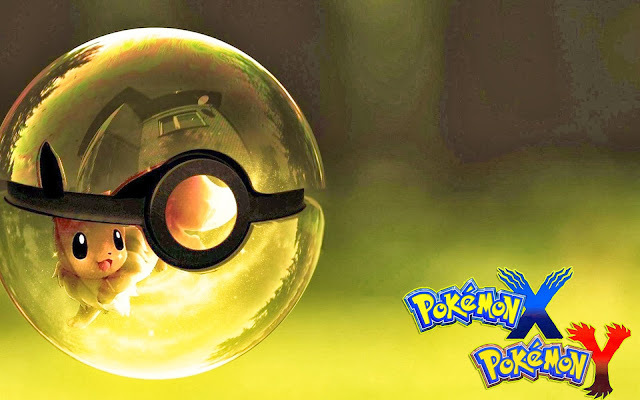 The in-depth 3D effects of the game during Pokemon Battles are another highlight to look out for as you play the game. You really need to give time to get used to the 3D effect before actually seeing the depth of the screen. Battle sequences are also improved as the movements are much smoother than what they did in Black 2 and White 2. Not only that, unlike the previous generations of Pokemon games, Pokemon X and Y allows you to choose your own avatar after the gender selection at the beginning. Rather than sticking to only 1, you are allowed to look different from what your friends choose if they too own the game. Due to popular demand, Pokemon X and Y have also successfully made their game into an MMO when the device is running on internet. It has allowed more interaction amongst players in the game. The interaction amongst players with NPC (Non-Playable-Characters) is also improved as the NPC will try conversations that will make you feel like you’re actually conversing with them (unlike previous generations, where the NPC treats you like a dumbo). Though we’re only 30 minutes into the game and I’ve yet to face a single gym yet but there is definitely a lot more to expect on Pokemon X & Y. This has definitely worth my money. ps. In celebration of the release of a new generation of Pokemons, a promotion is running to get a free Torchic when you purchase a Pokemon X or Y anytime before January 14th. 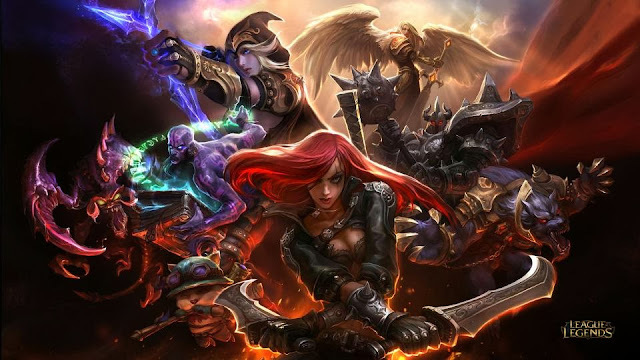 It has been 3 years since the beginning of the League of Legends (LoL) by Riot and for the 2014 season, it is about to face one of their biggest changes in LoL history. As most of you know, League of Legends began without any specific roles in each champion which then evolved to a game where roles matter. With that, Riot decided to pump up the roles in the game and make changes from the gameplays they have been observing. This season’s change is mostly based on the support and jungle role in the game. League of Legends players would know that in the game, the ones are always lacking behind in order to help their team are usually these two roles. Let’s start off with the supports. Supports in L.o.L. are usually known as the non-killer, sacrificing and warding role for the team. Wards are of one of the importance for a support in the previous seasons, causing them to roam around and planting wards (Either most of the time being ambushed by gank or away from the fight leaving them lacking of gold and experience). With that in concern, wards are now made into a team effort as each player is only allowed on planting with a maximum of 3 wards. The burden on the support role players are then decreased as placing wards around the map is now a team effort. Then move on the Jungle role players. Jungle role players never gets a lane to farm and are always pushed to jungle camps for their buffs and jungle creatures for farm and experience. With that, Riot now has added an extra jungle camp for the Jungle role players to get more farms of gold and experience. The jungle camp consists of a wrath with a kill that gives 60 gold to the jungle role player upon kills. 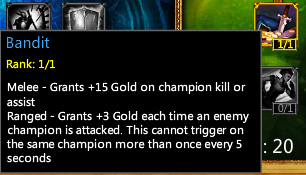 As mentioned above, Jungle and Support roles gets the least farms of gold and experience. With the new and updated masteries, they now are able to keep up with the team as they play. • Bandit – Helps grants extra gold to the support players mostly in the bottom lane with the ADC. • Scavenger – Also, more for the support role players, they tend to gain an extra gold each time their ADC gets a kill on nearby lane minions. • Inspiration – Increases experiences for jungle and support role players who are always lacking behind in terms of level in the team. Also, adding up to the challenges in the game, bushes now are trimmed to make hiding, ganking and warding a bit harder for players. Tip of the bushes are trimmed makes camping jungle role players take more time to reach their target and also be seen much more when approaching for the gank. With the bushes trimmed, there will be more bushes to cover to be warded which will really put the team into a warding spree amongst the players to stay alert and on watch all the time. Lastly, a minor change to the Dragon as difficulty of taking down the Dragon will now be harder as time goes. However, price of slaining the Dragon will also increase as time goes. Slaining the Dragon has never been as rewarding as it is now. The wait is over! Jinx is finally on the list of champion selection to the battlefield of Summoner’s Rift. A sister of Vi and also categorized as the Loose Cannon who is mad about explosions, Jinx! Though I was hoping for a new AP (Ability Power) mid player, Jinx is marked as a marksman in the game, also known by most players, an ADC (Attack Damage Carry). Being a support player myself, I’ve never ventured into trying out an ADC role. Mostly will be known as a champion to be playing the bottom lane as the support. Zap is a however weaker ability that slightly damages the target but it slows as well as reveals the target for a while. Not much to harp on as Jinx’s 3rd skill, Flame Choppers are much more like an extra ward when activated in bushes. Similar to Caitlyn’s Yordle’s Snap Trap, Flame Choppers are placed as a trap for any enemy who steps on it. Flame Choppers lights the enemy on fire as well as rooting them in place. Lastly, Jinx’s ulti, Super Death Rocket. Like Ezreal’s as well as Ashe’s ulti, Jinx’s ulti allows her rocket to travel across the map. The further it travels, the harder the hit. The rocket however, does not affect the minions and will only explodes once it comes in contact with an enemy champion. Not to forget, Jinx also have a unique but personally, a overpowered passive. 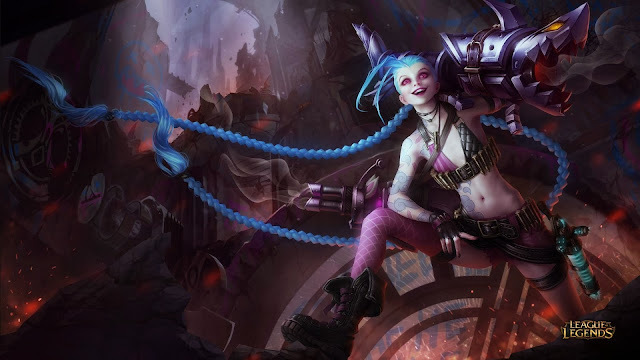 Once Jinx assists or kill an enemy champion or turret, Jinx massively gains movement speed which can either help to escape or chase down for a killing combo. How would you like to play Jinx? Well, that’s for you to find out. AP Jinx or AD Jinx for you? (You frequent League of Legend players will get me!